Just4bass was fishing for Capt. Mike Shellen today. We had SW winds at 10 mph and the water temp 80-87. 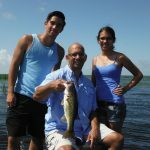 I was fishing with Alex Gongar, Daisy Gongar and Christopher Gongar of Pembroke Pines, FL. Here a picture of the day.